IDEA's JPA stuff half a year ago). in order to end up with nicely mapped java classes? successfully used IDEA's JPA stuff half a year ago). perform these days in order to end up with nicely mapped java classes? AC> From recent IDEA builds JPA (and Hibernate) facet has "Descriptors"
AC> descriptors. Probably this step is what you're missing? (which there is, in fact). should work, I'll try some more with the EAP build. Tried with a clean setup, but still didn't work. 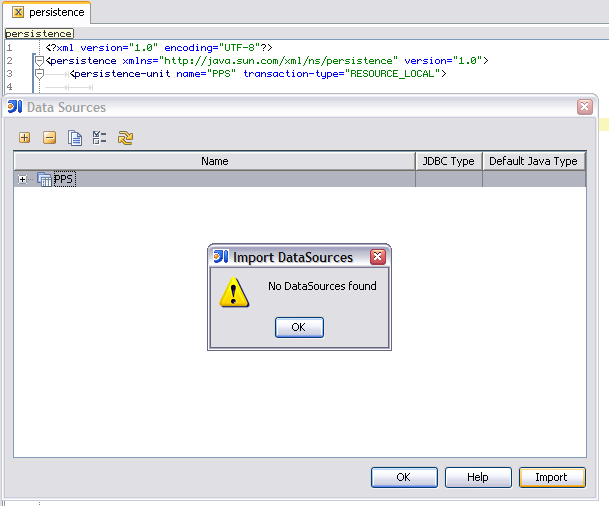 It still wants a J2EE App facet before it can create a datasource, and when clicking import on the datasource panel it tells me there's no datasource. As a sidenote, I just opened the same project with M1 and managed to create the mapping from the context menu of the module. It looks like the mapping entry in the pop-up menu has been replaced with the import button on the datasources dialog (as I wasn't able to find the mapping entry on the pop-up menu in the latest build), but the new button does not work properly. Or do I miss something obvious here? JavaEE structure view on Facet and PersistenceUnit/SessionFactory nodes.